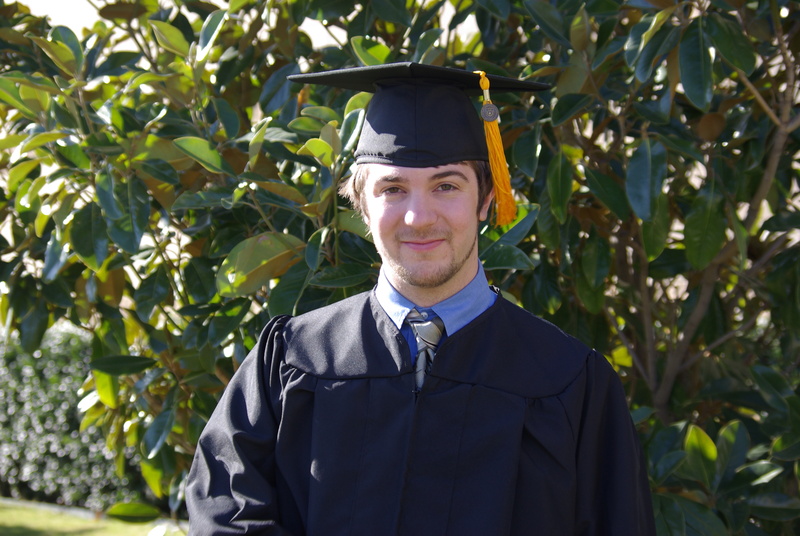 New UT-Dallas grad: Congratulations, Kenny! Cue the show tune, “Sunrise, Sunset.” Quickly go the years indeed. For the second time in our lives, elder son Kenny and I experienced a university graduation ceremony together. This time he wore the gown, and I was the one who didn’t cry and disturb the audience. 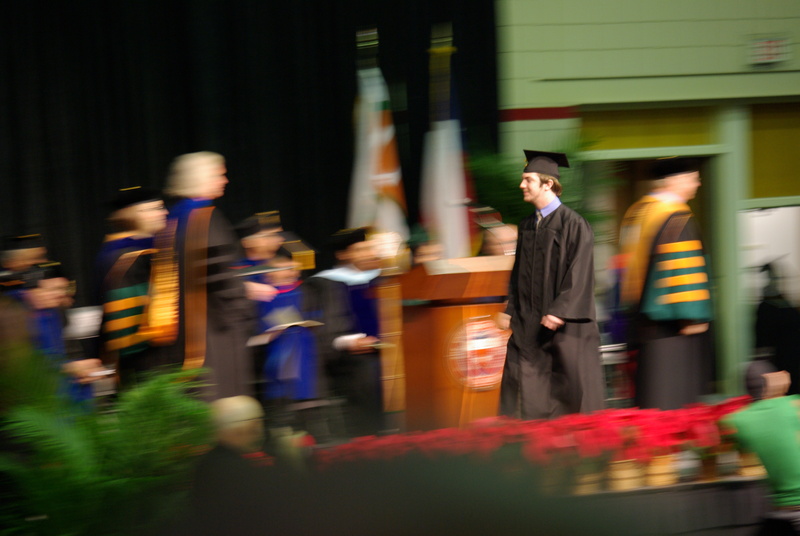 Kenny got his diploma in neuroscience from the University of Texas at Dallas Saturday. At the bottom of the photo you can see a fellow in a UT-D green t-shirt — the official photographer of the day. Kenny’s elation showed so well, the photo that guy got turned up on UT-D’s website (photo #11 in the series). [Update] Here’s the “official” photo of Kenny with UT-D’s President David Daniel. Some time in his high school days Kenny got the idea that he’s responsible for his own education. At UT-D he took control of his time and learning. His graduation is his own doing. Congratulations, Kenny. I have it on good authority your parents are beaming. Nice cap to the year. Older son Kenny nears graduation there, but we still get the newsletters to parents bragging on the school, and there is much to brag about. The Good Folks at the University of Texas at Dallas asked us to share this story. It’s right up the alley of a blog that worries about education, so share it I will. An Arts and Technology student’s video account of a professor’s classroom experiment with Twitter is making waves on the World Wide Web, capturing thousands of viewers on YouTube and prompting an article in U.S. News & World Report. UT Dallas graduate student Kim Smith’s video, “The Twitter Experiment,” shows how Dr. Monica Rankin, assistant professor of history in the School of Arts and Humanities, uses Twitter to engage her 90-student history class in discussion. The communication application helps overcome the logistical issues involved in having scores of students interact in a short time span and encourages shy students to participate in the course. “The video is a living example of what my Content Creation and Collaboration course with Dan Langendorf was all about: using emerging media technologies as a tool for education, collaboration with other fields, and documenting the experience for everyone to have access to,” said Smith. Twitter is a social networking and micro-blogging service that lets users send and read each others’ updates, known as tweets, in short posts of 140 characters or less. The Twitter video was a course project for Smith’s digital video class. The video, which took roughly 20 hours to record and edit, was shot during two class periods, one at the beginning of the semester and one at the end. Classmate Joe Chuang helped with the video and editing. The collaboration of Smith and Rankin began when Smith documented a class trip to Guanajuato, Mexico, in 2008. They kept in touch via Facebook, and developed the idea of using Twitter in the classroom at the beginning of the Spring 2009 semester. Smith worked out details on Twitter with Emerging Media and Communication (EMAC) faculty members Dr. Dave Parry and Dean Terry, who referred her to individuals who had done similar experiments. To get students comfortable with using Twitter in a classroom setting, Smith created a simple how-to video and attended class to help Rankin introduce the idea to her students. “I have gotten several direct messages from people saying that they were more ‘traditional’ and would not have considered using the social networking and micro-blogging tools in this way, but opened their minds after seeing the video,” said Smith. A few weeks later Smith posted the video on YouTube, and an entirely different wave of viewers picked up on it. On Monday, June 1, “The Twitter Experiment” registered 500 views in a few hours. Read Write Web and other popular blogs had picked up the video, causing views to skyrocket. “I love my classes and experience at UT Dallas and want to master how to use what I learn in EMAC to help professors like Dr. Rankin, who are willing to consider new technologies intelligently and experiment with what they offer,” said Smith. UTD, where the football team is still undefeated. Seriously, have you thought about using twitter in class, for coursework? Please tell us the story in comments. Meanwhile, I’m wondering just how I could make this work, in a district where cell phone use by students is against the rules (ha! ), and where students are discouraged from using laptops in class. In Irving ISD, where every high school kid gets a laptop, this could offer some great possibilities (anybody from Irving reading this; anybody try it yet?). I’ll have to check to see if our network can handle such traffic, and I’ll have to get an account on Twitter; we have 87 minute class blocks, and smaller classes, but it’s tougher to get kids to discuss in high school. With the layoffs in Dallas ISD, support for new technology tricks in classrooms is essentially non-existent. Can I do this as a guerrilla teaching project and make it work before I get caught? I may have to get some of these people at UTD on the phone. If you’ve already overcome these problems, put that in comments, too, please.